ADDS Up Engineering introduces their patented Oscillating Fan Sprayers to provide maximum coverage while using reduced, low volume spraying. 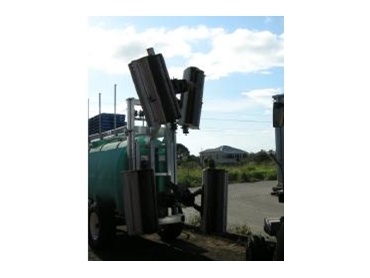 The Oscillating Fan Sprayers are ideal for crop industries, particularly with trees. The ADDS Up Engineering Oscillating Fan Sprayers works by allowing the fan to oscillate the sprays from top to bottom, then return to its original starting point and starts the spraying again. The Oscillating Fan Sprayers are capable of spraying trees up to 6 metres high with spray machines up to 6,000L and 4 x 1,200mm Long Fans. Speed of oscillation is adjustable from inside the tractor cabin. Spray speeds of approximately 4 to 5 km/hr are achievable with oscillations up to 45 RPM. The high pressure pump is capable of 40 Bar to allow successful penetration and coverage. Less moving parts compared to an oscillating sprayer. Better penetration than Air Assist Sprayers.